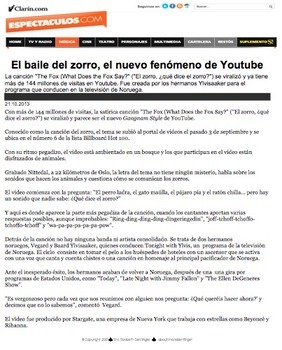 Actividades con la canción: ¿Qué Dice El Zorro? This is a zip file download for a variety of activities to use with ¿Qué dice el zorro? The spoof is of the satire song What Does the Fox Say? - the current Youtube sensation. 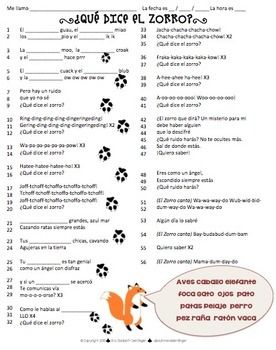 These activities will have students using listening and reading skills, and will also reinforce recognition of the Spanish animal names and animal body parts included in the song. 1. Teacher Info Page: includes ACTFL Standards met! 2. Lyrics in Spanish and English! 3. Article with 11 questions about the writers of the song. 4. Cucharas Game that uses animal names and animal body parts in the song. 5. Crossword Puzzle with animal names and animal body parts. 6. Most documents include PDF and Word documents in case you'd like to adapt them for your own students' needs. If this link is removed, please send me your email and I will send you a copy!